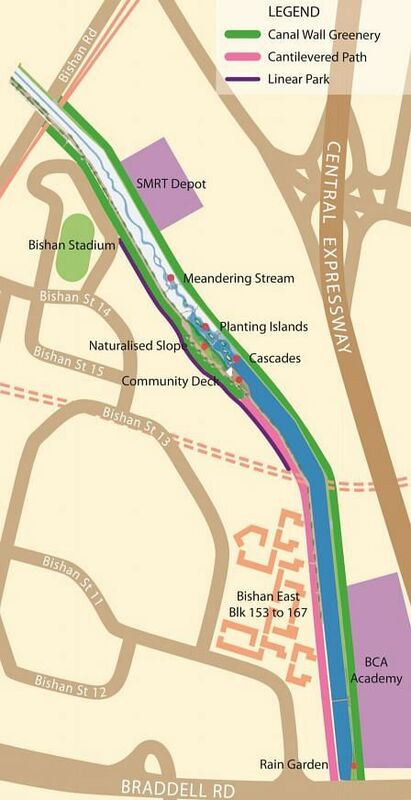 SINGAPORE - A 1.8-kilometre stretch of the Kallang River - between Bishan Road and Braddell Road - will be transformed from an old concrete canal to a cascading stream by the end of 2018. The project, part of the PUB's Active, Beautiful, Clean Waters (ABC Waters) Programme, was unveiled on Saturday by Bishan-Toa Payoh GRC MP Wong Kan Seng. The river's look will be refreshed in four ways, starting from a 100m stretch at Bishan Road, where canal walls will be greened using planters and creepers, thus softening the concrete hardscape. This leads on to a 410m-long stream that meanders its way around the planter islands within the channel. Following this, the stream widens and passes over a series of cascades to meet a permanent body of water. Cantilevered decks along this 910m stretch of Kallang River will allow allow residents to get closer to the water. But the improvements will not just be for aesthetics. The PUB said: "Together with the enhancement works, this section of the river will be deepened and widened as part of drainage improvement works to cater to more intense storms." PUB added that a community deck and seating will be created to add communal spaces and bring residents and park connector users nearer to the waterway. As part of the makeover, PUB and the National Parks Board will also be jointly developing the Kallang Linear Park along the river, between Bishan Stadium and Blk 165 Bishan Street 13.